Our very name says what we do! We cater to skin. YOUR skin. Proving we can be a little more serious when it comes to caring for our clients, Kim & Leanne discuss collagen treatments vs. natural treatments for your skin in this short episode of Coffee Talk! But of course, we can’t help but to let our personalities peek through. To learn more about the product, Stargazer, go to our online shop! 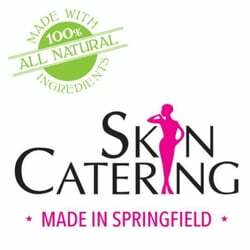 Our SkinCatering team is a personable, happy, and I’m thrilled to say – humorous, team! Here we are with our second video ever, a series called “SkinCateringTV: The Happy Hour Show“ – our version of The Late Show where we have special guests visit us for a chat (and some bevvies), and to play one of our fun games! Karen Boyd of MIX 931 was the Celebrity for our first show, and the game is Spa Pictionary! In an effort to show you our silly side, here is our very first episode of SkinCatering TV! We hope you’ll enjoy it with the spirit in which it was filmed – good humor. Stay tuned for our next episode in October! In the name of having a little fun, a few spa team members got together to shoot a video for the new SkinCatering YouTube channel that will be making it’s debut this week. We hope you’ll subscribe so you don’t miss any of the spa-tacular episodes we have planned! While we were changing the set, Kim told us a little story.